One more on the needles. I realized that, as a gift for my mom, she’d probably prefer a set rather than a single one. 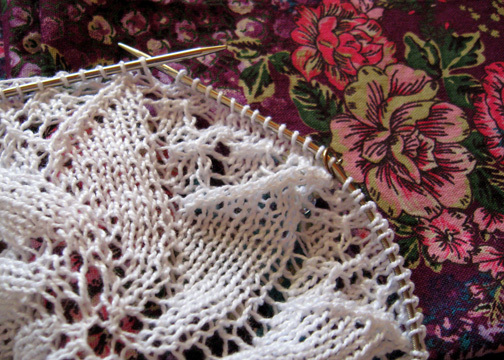 They knit up fast – I’m about halfway into the 2nd – so I don’t have any fear about not finishing it in time. The worst and most time consuming was the crochet edging. Perhaps with this 2nd one it will go faster/easier. 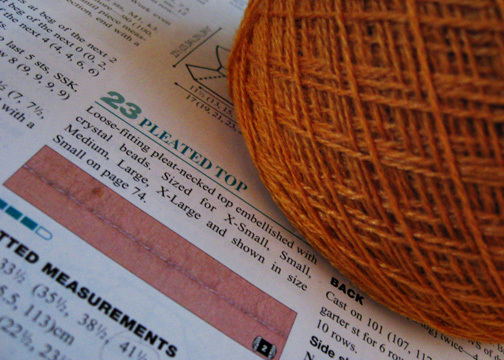 I got it into my head today to pick up my needles and knit something lacy. I’ve been on a roll with making things for the house lately, though mostly those projects were sewing related. And I’ve been a little bored with my current projects on the needles (so much boring stockinette on this pleated top!) . 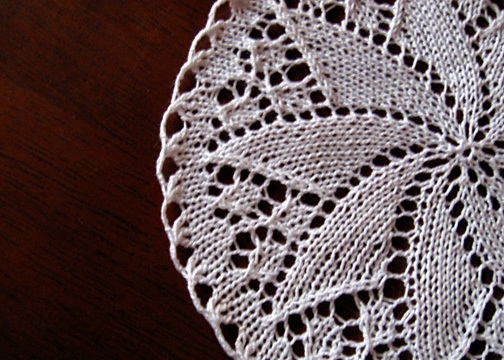 So a little lace doily felt like just the thing I needed. I think I’ll gift this one to my mother when it is finished – it would look pretty on her bedroom dresser! I’m working on Flacon. 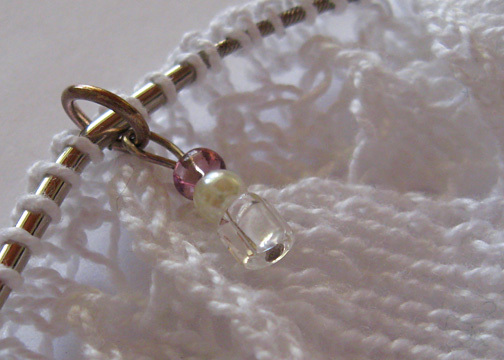 It’s not a difficult pattern – the worst for me has been dealing with slippery stitches on DPNs (should have used my wood needles instead of metal), and then some difficulties with my hands and the small circular after I ended up with too many stitches for my DPNs. I think I’ll work on Mommes Lysedug next. 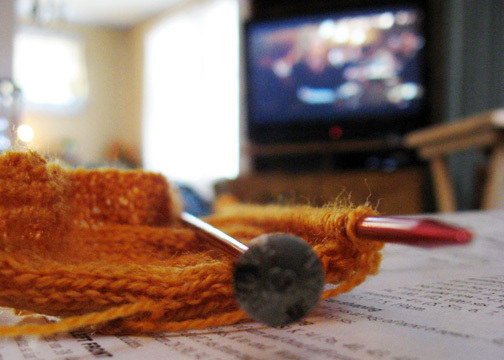 Strange – I’ve gone most of my cold winter hibernation not having the desire to really sit down and knit or spin. 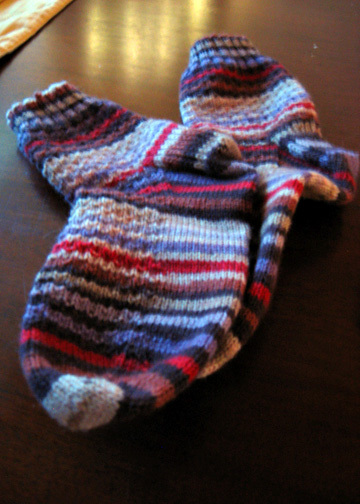 And then the other day it really hit me hard, so I finished this pair of socks I’ve been working on for what feels like forever. And I sat down at the wheel to spin, and now I’m 3/4ths of the way done with the plum fiber I was working on. And I ordered new fiber (not that I needed it). We got a lovely snow yesterday, though the roads were awful, and they’re calling for more snow overnight tonight. I have a project to keep busy this weekend – painting our home office. I had a hard time picking out a color, and I finally decided on one called “Satin Weave” – but now I’m second-guessing myself because in the store the paint chip looked a lot more yellow than the off white/tan I wanted. But I did the whole “tape the chip to the wall in the room” thing to make sure it looked right throughout the day, and it did, so we’ll see. I have to tape and prime the walls first (paneling, not my favorite thing to paint over but I certainly have more than my fair share of experience with it). Hopefully, when all is said and done, I’ll come away with a really lovely new color for the office so I can sew and craft and work feeling more at home and less like I’m in a dark cave. Brown Sheep Legacy Lace in Golden Sunrise. #23 Pleated Top from the Spring/Summer 2009 Vogue Knitting. The first project cast on in 2012 for me.